VietNamNet Bridge – Local authorities, agencies and organisations in HCM City have been implementing several programmes to ensure that poor and disadvantaged people enjoy the Tet (Lunar New Year) festival. Le Thi Bich Khanh, deputy chairwoman of the Binh Thanh People's Committee, said her district has made plans to organise Tet entertainment activities to ensure that Tet festivities are enjoyed by every family and every individual. "Binh Thanh will present 200 gifts, each worth VND500,000 (US$24), to disadvantaged households who are beneficiaries of the State's preferential policies, 1,200 gifts for poor children and 120 gifts for poor teachers," she said. Poor households with an annual average income of below VND12 million ($570) per person will each receive gifts worth VND300,000 and those who have an annual average income below VND8 million ($380) per person will receive gifts worth VND500,000. Nguyen Thi Nam, who lives in Binh Thanh's Ward 21, said: "My family is listed as one of the district's poor households. Thanks to gifts and the care of local authorities, my family will have an adequate Tet," she said. This Tet, the city's Fund for the Poor will spend about VND3.6 billion ($171,000) to care for households who are listed for the State's preferential policies, disadvantaged workers and students. 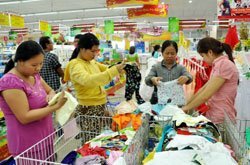 Duong Quang Ha, head of the fund raising board, said the fund has mobilised agencies, enterprises, ethnic and religious groups as well as the general public to donate under the theme: "Do not let any poor household miss out on Tet". City agencies and organ-isations last week began to visit and present Tet gifts to the needy. The visits will last until January 18. Tet falls on January 23. Meanwhile, the city's Red Cross chapter will present 25,000 gifts, each worth VND300,000, to disadvantaged households. Nguyen Thi Hue, chairwoman of the chapter, said these gifts were made possible by donations from the community at large and philanthropists. The HCM City Export Processing and Industrial Zone Authority (HEPZA) will give 6,000 bus tickets to industrial park workers who have not returned to their homes in the central and northern regions for many years, according to HEPZA Trade Union. The union will also present thousands of gifts to laid off workers and migrant workers who stay in the city during Tet. In addition, many companies will support employees with Tet gifts and bus tickets. The city's Youth Union will give 1,000 gifts and 1,000 bus tickets to young workers. The HCM City Women's Union also has plans to provide 1,000 gifts to female workers and provide other assistance to them, especially those who are unable to return to their homes to celebrate the Lunar New Year festivals. The city's Farmers Association will also give 1,000 clean water storage tanks, gifts and health insurance cards for disabled children of farmers. The total value of the assistance provided is estimated at VND5 billion.